A special group of workers completed four and a half weeks of sprucing up Nebraska Game and Parks Commission properties in northwestern Nebraska this week. The seven workers of the team were enrolled in AmeriCorps, the federal National Civilian Community Corps program that provides intensive service learning opportunities for adventurous workers ages 18-24. The group joined Commission staff in completing a variety of projects to improve Walgren Lake State Recreation Area, Chadron State Park, Metcalf Wildlife Management Area and Chadron Creek Ranch WMA. The group, which was given the name Oak 3 by AmeriCorps, consisted of members from New Hampshire, California, Colorado, Georgia and North Carolina. At Chadron State Park, where the team members stayed in cabins throughout their service, projects included removing old fence, painting buildings and shelters, and spreading wood chips on hiking trails. 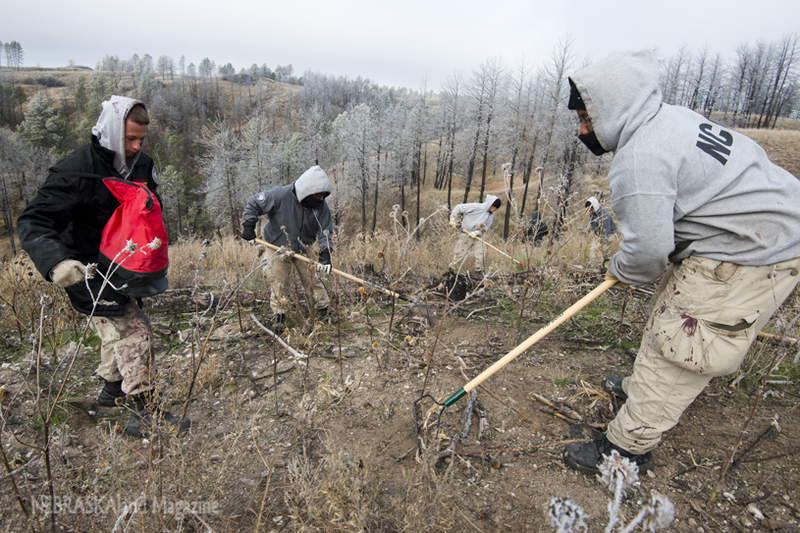 They also picked up downed branches and other debris that had accumulated along Chadron Creek after the massive October 2013 snowstorm. At Walgren Lake near Hay Springs, the crew painted restrooms, picnic tables and guard posts. For another project, they sealed rafters in the picnic shelter to discourage nesting by birds and bats. They also removed a dense stand of saplings, mostly cottonwoods, which had taken root along the shoreline. 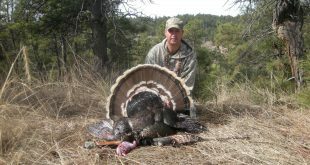 Greg Schenbeck, Commission wildlife biologist, echoed Galbraith’s sentiments and said the crew contributed to projects made necessary by the 2012 wildfire at Metcalf WMA north of Hay Springs. Where soil had been disturbed by recent mechanical operations to remove burned trees, the crew planted seeds for a variety of grasses and forbs desirable to wildlife and beneficial to the area’s ecology. They also removed a considerable amount of damaged fence on the property, along with some woven wire fence considered to be a hazard to wildlife at Chadron Creek Ranch WMA. “We still have work to do from those wildfires, so we were certainly glad to have capable help,” Schenbeck said. 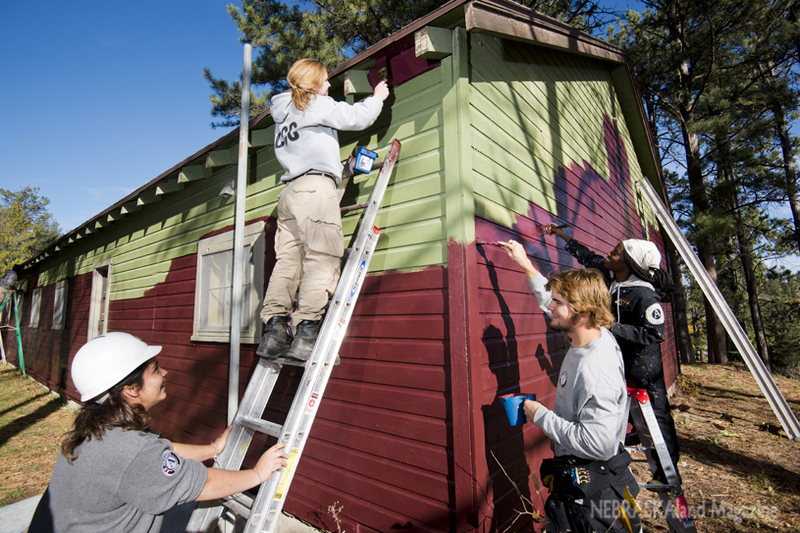 It was the second consecutive year for an AmeriCorps team to provide service in northwestern Nebraska. Prior to coming to Chadron this fall, the Oak 3 team had completed projects in Wisconsin, Minnesota and Michigan. Oak 3 member Sara Witsken, 23, of Grand Junction, Colorado, said the experience has helped the team members grow professionally and gain valuable life skills while visiting areas they otherwise wouldn’t get to see. She said the projects at Metcalf WMA were the most challenging.